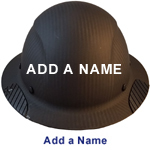 Each Carbon fiber hat comes with a 6 point ratchet suspension and should fit head sizes 7.0 to 8.0. The suspension comes with a soft padded top to offer additional cushioning for the head. Finally the full brim design is wider on the sides and back to offer protection from the outside elements. This is truly an impressive hard hat. Absolutely love this hard hat it's my favorite thing is it it comes in a flat matte black color second is it its carbon fiber third is the rubber grip things that are on the brim great feature the only downside is it it is heavier than a standard plastic or acrylic type hard hats the price is a little expensive but I'm a firm believer in you get what you pay for this hard hat is definitely built to last. Click the button below to add the Actual Carbon Fiber Hard Hat - Full Brim Matte Black to your wish list.